Do you freeze up or experience a strong feeling of avoidance just at the thought of decluttering your home or inbox? If so, you’re not alone—and there is a very good explanation. Oh, spring cleaning. Here you are again. For years, you and I had an interesting dynamic. It went something like this: people would start talking about you, I would agree that I needed you, I would tell myself over and over that this is the weekend, and then I would make excuses to myself every time until you just sort of went away. This lack of follow-through seems harmless enough, but there were repercussions. I felt stress every day because of the clutter, and that clutter only continued to grow. One day, I had an honest conversation with myself to figure out why I had such an aversion to spring cleaning. Then it hit me—it wasn’t that I didn’t have time, it was that I knew I would be forced into dozens or even hundreds of decisions and the idea of it was just too daunting. Then I had a second realization: my avoidance behavior wasn’t reserved to deciding the fate of my material possessions, but was also coming to life every time I told myself this was the weekend I would tackle my cluttered inbox. I again saw that it wasn’t a matter of having time, but rather a matter of not being prepared to decide the fate of hundreds of emails. Decision fatigue is a very real problem. If you’re not familiar with the concept, decision fatigue is a psychological term that explains how, after making enough decisions over the course of the day, we reach a threshold where every subsequent choice becomes harder. In many cases, decision fatigue causes us to act irrationally. This phenomenon explains why we have a harder time saying no to junk food at night, why veteran quarterbacks make rookie mistakes late in the game, and why judges grant parole to 70 percent of prisoners who have early morning hearings but to just 10 percent of those late in the day. For some, the fatigue leads to decision aversion, which is a state when you avoid making choices altogether. When I think about my former aversion to decluttering, it’s clear to me that both decision fatigue and decision aversion played a role in the past. The times I did attempt to declutter my closet or my inbox, my earlier choices were swift and well thought-out. After a while, however, it became too tiresome to decide, so I avoided further decisions by keeping every old t-shirt and dated email that remained. Some go the opposite route and get rid of everything in question or declare email bankruptcy. With each passing attempt at decluttering, I remembered the mental strain associated with the times before, so I started avoiding the process entirely. I did this even with the knowledge that I would continue to be stressed until something changed. So how did I overcome my aversion tendencies? By establishing a method to the decision-making madness. This took time to evolve and adopt, but I can now honestly say that I am able to conquer decluttering with confidence and I don’t even wait until spring to do it. Be it your home or your inbox, if your main objective for the day is to declutter, do your best to start in the morning before you have made a slew of other decisions. In a similar vein, if you know you have very important choices to make, do not make them at the end of a decluttering or otherwise decision-filled day. One of my favorite strategies for decluttering is laying out general rules and questions for myself for the times when an answer isn’t immediately obvious. For instance, if I haven’t worn or used something in one year, it goes directly into the donate pile. Or, if I have a newsletter collecting dust in my inbox, I ask myself something like, “Will I lose anything by not reading this?” While there is still a decision to be made in this scenario, the questions help me streamline my process, put each email (or piece of clutter) into perspective, decide quicker, and ultimately last longer before succumbing to decision fatigue. For long and decision-heavy processes like going through all of your belongings or sorting through hundreds or thousands of emails, be cautious of planning a single day to take care of it. Instead, try setting daily or weekly goals over a period of time. For instance, on a chosen day or week, commit to going through your bedroom closet only. The next day or week, commit to going through your dresser, and so on. For your inbox, you could commit to sorting the important emails from the unimportant emails in week one and then set a goal for how many important emails you want to get through each day or week after that. Once the important messages are addressed, you would then move on to any unimportant emails that you didn’t delete or archive. With many things, knowing is half the battle. It’s no different with decision fatigue. Pay attention to what your body and mind are telling you. If your decision making starts to slow down or feel clouded, stop. Take a moment to appreciate your progress, allow yourself a break to do something that requires little choice, and then get back to it when you’re ready. Here at SaneBox, we like to say that email is like Tetris—no matter how good you are, the pieces keep coming and they do so at an even faster rate. In today’s globalized, always-on world, we have near-instant access to an astonishing amount of products and information, both tangible and intangible in nature. When possible, be selective about what you allow into your life. As with point number two above, consider creating general rules and guiding questions for when you’re uncertain about making a purchase or subscribing to a new mailing list. I cannot say that I will ever truly enjoy the process of decluttering, but I certainly do love the result, and these practices help me achieve it. Do you have a tip for decluttering or conquering decision fatigue? Please share it with our community. Ready to clean out your inbox? Great post! But who’s the author?? 😉 Someone deserves credit for this well-written, pertinent article. Just as Lauren said earlier, I especially like seeing the Bane of Decluttering through the lens of “Decision Fatigue.” I have been aware of decision fatigue for a long time — but only in relation to retail. Never occurred to me to apply the same concepts to emptying my email inbox! 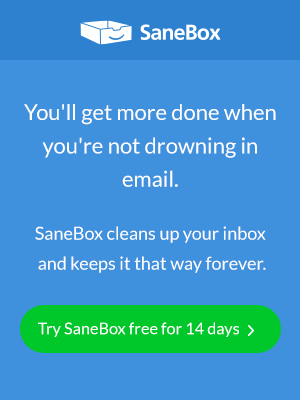 Best of all, SaneBox seems designed to reduce decision fatigue. One of the reasons I’ve become a huge SaneBox fan!